During their first meeting, they discussed the country’s economic and social progress over the last few years. 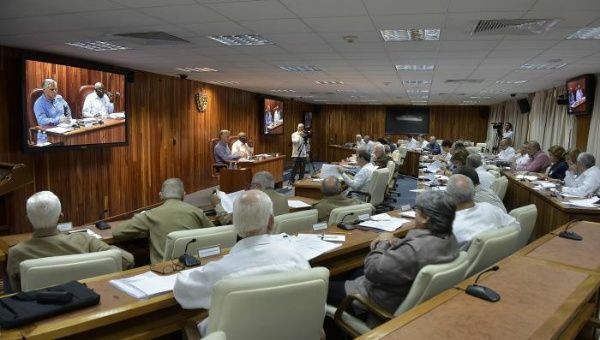 April 27 (teleSUR) Cuba‘s economic agenda and plans for the country’s overall development dominated the first meeting with the council of ministers held by President Miguel Diaz-Canel. According to a report published in Granma during the meeting, which took place Wednesday, officials also spoke about issues related to foreign trade and its economic effects on the island. Antonio Carricarte, Deputy Minister of Foreign Trade and Foreign Investment, offered details on several international trade operations that have negatively affected the country, the legal recourse applied and sanctions imposed on individuals involved in these operations. All present at the meeting, including former president Raul Castro, agreed that boosting Cuban exports should play a role in the country’s plans going forward due to the economic benefits and the positive image, it generates for Cuba. Those in attendance were also given a review of the economic indicators and progress in the financial plan during the year’s first quarter. Deputy Minister of Economy and Planning, Alejandro Gil Fernandez, explained that the “tensions regarding the availability of currency due to non-compliance with exports and the difficulties with the supply of fuel continue to affect” the island. According to a review of the country’s current economic plan, however, about 90 percent of the objectives set over the last few years have been met, but a few obstacles remain. The first is the non-entry of a group of imported supplies and the lack of preparation of the groups participating in the investment process. Despite these obstacles, authorities said the behavior of industrial activity at the end of March showed compliance with the state’s primary industrial production objectives. Other setbacks are related to climate conditions. Sugar production levels planned were not met due to an intense drought and a sustained period of rainfall that has worsened the effects of Hurricane Irma, which hit Cuba in 2017. The meeting reunited the council of ministers of the legislative period that ended last week. Diaz-Canel has postponed announcing his own council of ministers until the next parliamentary session in July.